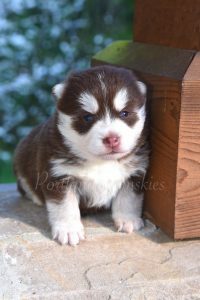 Preparing For Your Portland Pomsky Puppy! Food – Our puppies start out on Taste of the Wild Venison and Bison puppy formula. This is a great protein packed kibble for your fast growing puppy! Crate – Your puppy will need a crate for home and a crate for travel. The size we recommend for pomskies is medium wire crate. Here is a link to purchase one at Petsmart. What is great about this crate is you can cover it a night to create a den where they will feel safe and secure. It will give you peace of mind that your newest addition isn’t getting into trouble while you are away. Plus they love having their own apartment. The medium size is just big enough to put a plush bed in the back and a poddy pad in the front for when they need night relief. The same size is great for in your car, that way you don’t have to move it from your house to your car and vice versa. Air Travel Preparation – Once your plane ticket has been booked, call the airline immediately and request to add a pet to your ticket home. This guarantees the puppy can go on board with you and travel in cabin under the seat in front of you. They will ask for the dimentions of the carrier .We recommend you purchase the Delta Sherpa Medium travel carrier. It is best to line the carrier with 2-3 puppy pads and bring along some extras. This makes it easy to pull layers out if they relieve themselves inside the carrier. When the flight attendant makes their beverage rounds, request a cup with just ice to place inside the carrier so your puppy can stay hydrated. They love playing with ice. Do not put blankets in the carrier as they can overheat easilty with their thick coats. The humming of the plane typically puts them right to sleep and makes for a stress free travel home. 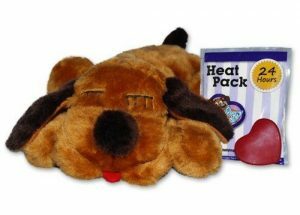 Toys – We recommend Smart Pet Love Snuggle Puppy Behavorial Aid Dog Toy, this toy is designed to help your dog cope with every day stressers. In your puppy’s case, the transition away from their litter can be tough. The toy is heated and has a heartbeat which feels to them like they are with their littermates and helps with the transition into your home. Their first night with you is their first night away from their litter and the first step into their new lives in your family. Avoid toys with stuffing as they will easily rip the toy open and can ingest it. Ropes, balls and KONGs are all great mind stimulating toys that they’ll be sure to love. Harness size – When your puppy leaves us they generally fit a size small harness and are around 5 lbs. A harness is a great introductory to leash training and what we recommend starting with. 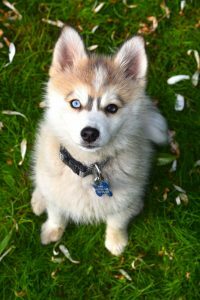 Shots, Worming & Wellness Exam – Before your puppy leaves Portland Pomskies they will receive their DHPP vaccine, a last worming treatment and a wellness exam to give them a complete clear bill of health. They will be due for their next round of shots between 10 and 12 weeks of age. We will provide you with a health pamphlet outlining the shots and wormings they have received that you will want to provide to your vet on their first visit. This way your vet can advise you of their care moving forward. Training – Your puppy will be eager to learn everything you want him to know. The first on everyone’s list is poddy training. Take your puppy outside as often as your schedule will allow and always offer a treat and praise when they poddy outside. Pomskies are very smart and can learn an endless amount of tricks. 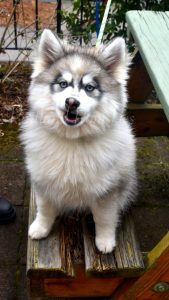 Research local obedience training facilities in your area for help in starting your Pomsky out on the right foot. We are here as a resource to you in preparing for your puppy. Feel free to reach out if you have additional questions. 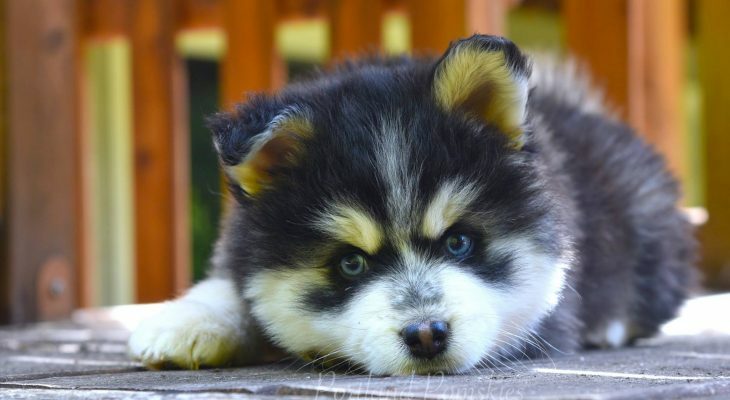 « How-To-Guide: Adopting a Puppy from Portland Pomskies!